This article is written in three sections. The first deals with vocalization, the second with how Greyhounds express themselves with eyes, lips, mouth and other parts of their lovely anatomies, and the third with overall posture and body language. It is slightly different from that of “other” dogs. Your Greyhound is like other dogs in most ways, but there are certain things Greyhounds do or “say” that other dogs may not. When I write “say,” I mean just that. 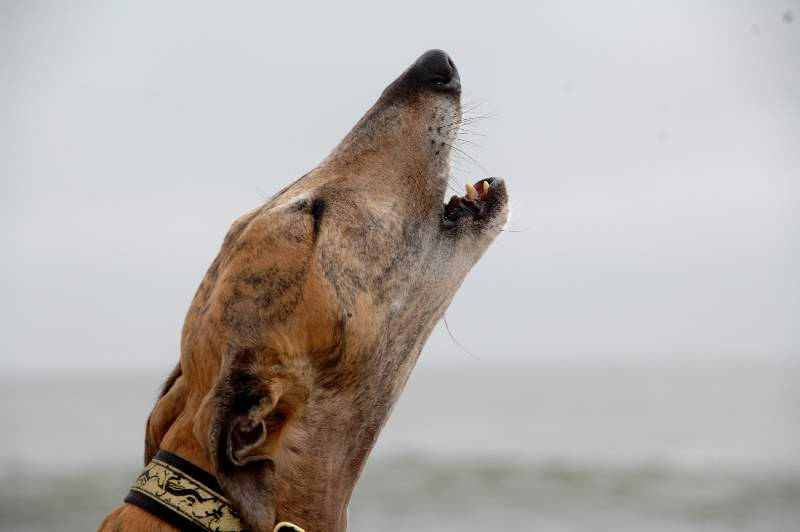 Greyhounds often vocalize. This behavior is sometimes puzzling, if not downright frightening, to many new Greyhound adopters. 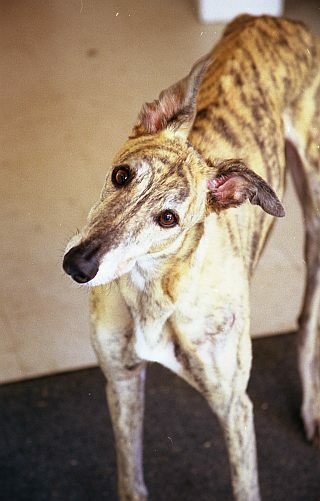 The Vocalization section of this article describes the various sounds Greyhounds make and then explains what your dog is trying to tell you. “He” and “she” are used throughout this article because we love both sexes! Usually, the first thing you will notice about your new Greyhound is that he is quiet. Most new owners swear that their Greyhound doesn’t know how to bark. This is not true. Once your Greyhound relaxes and begins to adjust to life in a home, he will indeed bark if the occasion calls for it. Many people jump out of their skins the first time they hear their Greyhound bark. He may well sound like something from the “Hound of the Baskerville” or she perhaps will shriek like a coloratura soprano. 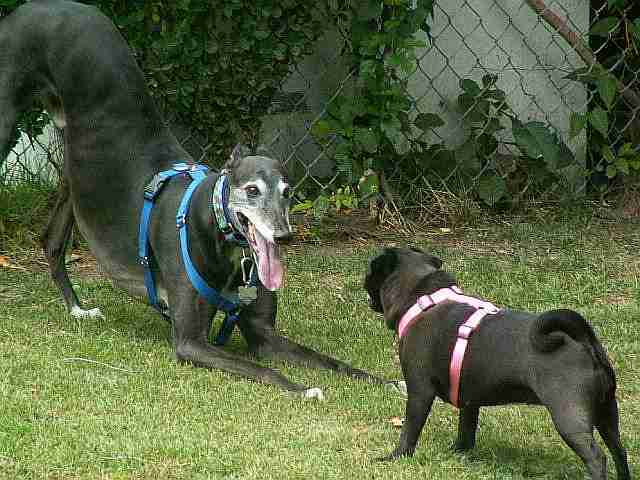 Greyhounds often will not bark when they want to go out to relieve themselves. If you are lucky, your Greyhound will stand at the door and whine or bark. But the shyer ones will often stand quietly at the door or pant gently, expecting you to notice that it has to go out. If no one notices these subtle signs, he will often relieve itself at the doorway! Some Greyhounds bark when a person or other dog comes to the front door or when another dog walks by the house. Some bark only at strangers. And some bark only at some strangers. This behavior is entirely individual and depends on the way your Greyhound reacts to certain people. Greyhounds are excellent character judging. 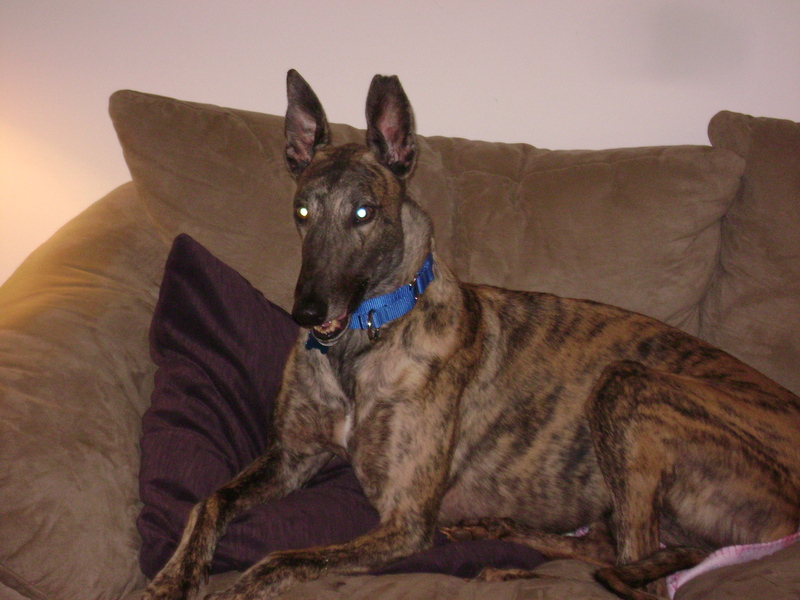 If a service person comes to your home and your Greyhounds isn’t happy, be forewarned about that person! Some barking is very ominous, yet it may be accompanied by friendly tail-wagging, not aggressive tail-wagging. There are different types of tail-wagging, but more about this in the BODY LANGUAGE section. Before you hear the first bark, you are likely to hear moans of satisfaction when your Greyhound lies down on a soft bed or some grunts if you happen to pet your new friend in a particularly satisfying place on its body, often behind the ear or even in the ear. Rest assured your dog is not ill; he is content. This is a scary thing to hear. The depth of a Greyhound growl can make your hair stand on end. Greyhounds don’t growl often. When they do, it can mean several things, depending on the rest of the body language. First, the growl can mean that you have invaded a personal space. You may have disturbed it while it was sleeping or dozing. Greyhounds often sleep with their eyes open. You may think the dog was awake, but it was in fact not awake. The phrase “Let sleeping dogs lie” certainly applies here. Many a Greyhound has been returned to an adoption group after it snapped at someone who stepped over it while it was sleeping with its eyes opened. Second, some Greyhounds may growl when hugged or when a hand is placed on its body for too long a period of time. Some other dogs will object to this invasion of space, but it just seems worse when your up-til-now sweet Greyhound does it to you or, more often, to your child. Rather, your Greyhound is simply not used to being touched this way and may interpret your affection as aggression. Some will growl when you want it to do one thing and it wants to do another. But that’s just general dog behavior. Dog owners of any breed must learn how to deal with getting their dogs to do what the owner wants it to do. That is not “Greyhound only” behavior. Third, any dog, Greyhound or not, will growl when it is leaned on, stepped on, or poked at too hard. Often, a Greyhound will have a racing injury or an ailment that no one could possibly know about without knowing the complete history before being adopted. Often, a visit to the vet will uncover an injury or disease, such as arthritis, which may have been brought on by past broken bones, or from the simple acts of running, or perhaps lying on hard surfaces. Many times nothing will be found, but if your hound growls when a leg gets bumped, it’s probably a warning to stay away from an old, undetectable injury. Fourth, but very common, is the play growl. This is very important to remember because, as you already know, Greyhounds are not barkers. They seem to communicate more with a throaty assortment of sounds than the common bark. 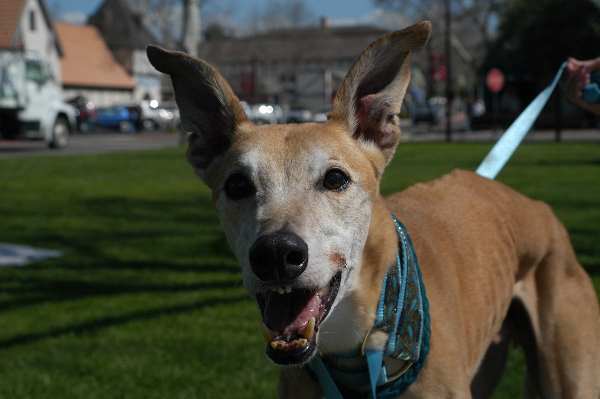 All 13 Greyhounds we’ve had over the years have growled in combination with the “Let’s Play!” play-bow stance of rump up in the air, elbows on the ground and tail wagging happily. Some will growl, wag their tails, and stomp their feet when they want your attention. When two or more are running around the yard racing with each other, especially with newly-adopted dogs, all dogs should be muzzled. They may growl here too. There is no meanness here. It is part of the race. We encourage dogs to wear muzzles because they can nip and tear skin in the excitement of the chase. That’s why they wear muzzles at the track. Fifth, even more interesting, some will growl while making a talking sound of “Err-ow, wow wow.” It sounds exactly like a combination growl and a serious attempt to speak in vowels, mostly a and o and ow and ooh. This is a serious attempt to have a conversation with you. Enjoy it and respond! When you have a few Greyhounds living with you, you will probably discover that your dogs will form a chorus, ranging from soprano to bass. This singing can start out of the blue or be brought on by hearing a siren or other dogs howling or even hearing the phone ring. Before you hear the first bark, you are likely to hear moans of satisfaction when your Greyhound lies down on a soft bed or some grunts if you happen to pet your new friend in a particularly satisfying place on its body, often behind the ear or even in the ear! Rest assured your dog is not ill; he is content. The Vocalization Section described how Greyhounds talk with you and with each other. They vocalize in strange and wonderful ways with their barking, moaning, grunting, teeth-snapping, “snorfling”…….., growling, whining and even singing. Understanding these means of communication is important. They are the primary methods that your dog uses to tell you how he feels or what he wants. Your dog has another way of communicating with you and other animals besides vocalizing. This other type of communication is called body language. Much has been written about body language between and among people; the same is true for body language between and among animals of all kinds. Not every type of body language is interpreted exactly the same way by animal behaviorists or even experienced dog owners. If you’re not sure of a particular behavior, read what other writers have to say about it. There is a lot of folklore about what a wagging tail means. As a matter of fact, just because a dog is wagging its tail doesn’t mean it’s friendly. It this intrigues you, read on. Most people love to see a dog wagging its tail. “Gee, what a happy dog!” is the first thing that comes to mind when a dog wags its tail. Is it true that when a dog is happy it will wag its tail? Yes, but the type of tail-wagging is the key to how a dog feels. Most times, friendly dogs will greet people with the tail either wagging wildly back and forth so hard and fast that you think its tail will fall off or it will be a wide, lazy sweep. But there are other types of tail movements that mean something besides happiness and friendliness. There are so many varieties of tail movements that the different ones are bolded for easier identification. Very important: When the tip of the tail wags, you are seeing possible aggression or dominance but not attack. The rest of the body will likely be erect, the legs stiff and slightly spread apart and ears up. If you see this, be careful. The dog probably isn’t going to attack; it just wants you to know that she is there, is alpha, and is something to be reckoned with. He – or she – is more likely saying “Hey, look at me!” I say “possibly indicates aggression” because one of my dogs did this when he wanted a cookie, but the behaviorists will tell you that this means aggression. Plus, the deep, loud bark he also uttered at the same time would scare a new owner the first few times it happened. Many inexperienced Greyhound owners are ready to return their dog when they see or hear these behaviors. Please don’t. Get to know your dog and it’s combo of body language. And you’ll have to see what the ears, eyes, and mouth are doing, too. Another straight out tail position has nothing whatever to do with aggression. It can mean your dog has to move its bowels! This is a perfect instance of observing what the entire dog is doing, not just watching the tail. This is when the tail droops straight down and doesn’t move. This dog is feeling kind of neutral about things. The lower the tail, the less happy it is. The tail between the legs means one thing: fright or the deep uncertainty of the newly-adopted dog. This position may occur long after the adoption in the shyer Greyhound. A tail held low means the dog needs comfort and is being submissive. Often a dog will grin at the same time; the lips will pull back. This is sometimes mistaken for a snarl which is quite different and not very likely to happen if the tail is wagging low. Again, you really have to look at several parts of the dog’s body to determine what is really going on in the dog’s mind. Dogs, especially greyhounds, have a way of starting adoringly at you. If the body and eyes are relaxed, the dog has accepted you as alpha and is loyal and accepts you as leader. But sometimes, the stare means aggression. It all depends on the rest of the body language, especially if the body is stiff. If you want to be dominant over your dog, you would stare it down. However, if your dog isn’t backing down or looking away from you, staring back at the dog is definitely the wrong thing to do. This is a challenge that could escalate into a battle that you don’t want. It’s training time when this happens. Another way dogs use their eyes is for active aggression. When a dog stares at you but its head is sideways and tilted upward, it may mean the dog and you are in for a hassle. But – I get this look when I’m trying to give a pill and the dog is going to give me a hard time about taking that pill. Using the phrase “active aggression” is a misnomer in the pill situation. It’s an “I dare you to pill me!” In another situation, that look may mean trouble of a very serious nature. Then again, look at the lead photo in this article. That is simply a look of adoration. Again, watch the whole dog, not one expression. The dog who won’t look at you at all is showing you submission. This is the look of the recently-adopted Greyhound who doesn’t know you or where it is living and is still nervous about its new life. Be kind but firm with this dog. Pupils of the eyes are a key to the dog’s feelings. If they are dilated, the dog is afraid and may become aggressive. Occasionally, dilated pupils mean the dog is not feeling well, and when this is the case, you won’t see the other signs of an aggressive dog. You’ll see it with the hang-dog look. Greyhound ears are truly amazing. Most breeds of dogs have an ear set that is predictable. Cockers have ears that flop. Shepherds have erect ears. But Greyhounds! Anything can be expected here. The average Greyhound has ears that hug the head for aerodynamic reasons. Their ears do, however, do many tricks. They stand straight up like the Shepherd or Doberman; they go out like your average mixed breed; they go back tight to the head like a normal Greyhound. And, often one ear will go one direction and the other in a totally different direction and position. Many Greyhounds have what we call a chapeaux. “What hat are you wearing today?” we ask. 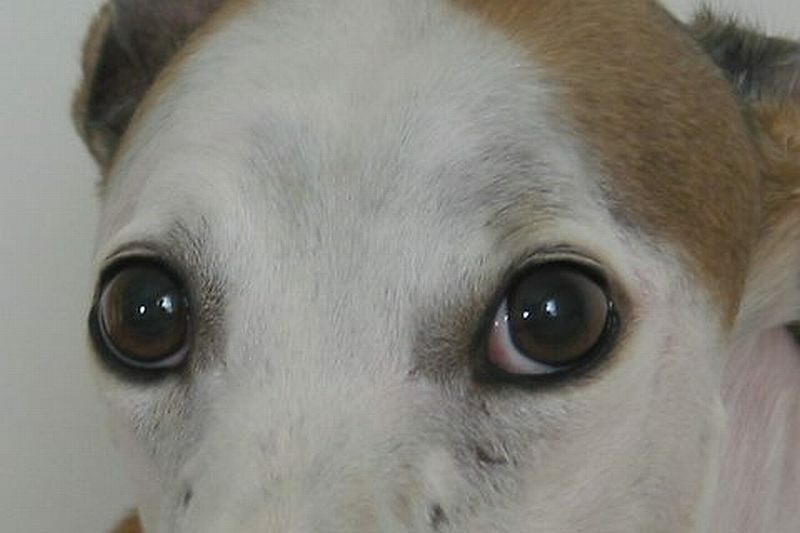 If a Greyhound’s ears are straight up or out, it is listening. In any other dog, ears up and forward means potential aggression. In this writer’s opinion, the ears held out perpendicular from the head show an alert dog, whereas this may be the clue to possible aggression or dominance in another breed. The Greyhound is far more likely expecting something, like a treat or a trip outside. When the ears are like this a lot you have a photogenic dog. It’s always “photo op” with a Greyhound like this! 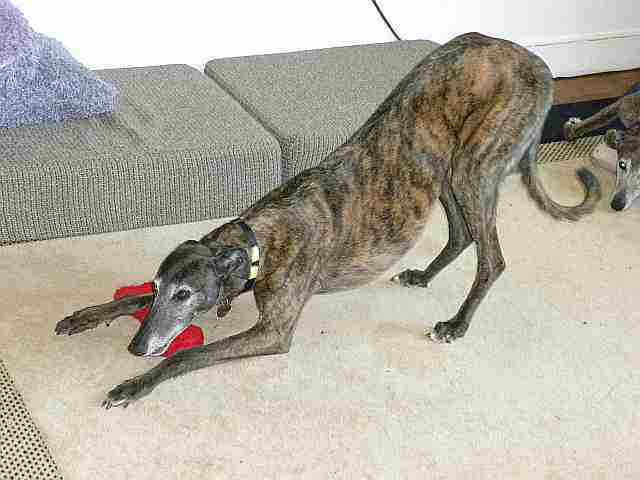 The forward ear position is the classic sign of aggression in a non-Greyhound. I have never seen such a position in a Greyhound, possibly because there are very few aggressive Greyhounds or possibly because their ears just can’t do this. When a Greyhound holds its ears back to the head, it is showing its normal ear position. Try telling this to an animal photographer who doesn’t know Greyhounds. A knowledgeable Greyhound photographer might not insist on the “straight-out” pose, although it does look great in a photo. 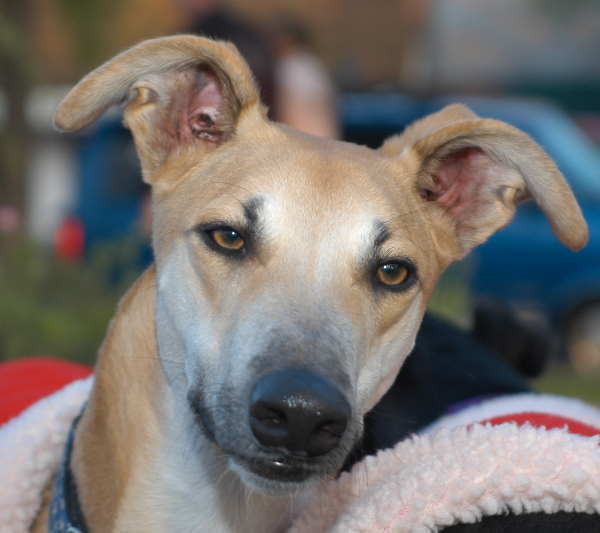 Greyhound ears don’t give the same clues as do other breed dogs. A set of ears held tightly against the head is showing tension. It’s not so easy to get a group of greyhounds to pose like this. Just look at those ears. The smile is beautiful and varied. Some actually pull their lips back and show you a disarmingly human type of smile with teeth together. A few lift their upper lips and look so nasty you’d swear they about to bite you. They’re not unless you have good reason to believe something is wrong. They’re actually smiling! Other smiles look like panting, but there is no hard breathing. The Snarl-Smile Means Greyhound Humor! Smiling can mean submission. But for Greyhounds and some of their sight hound cousins, smiling is an art form. A smile means just that; a smile. Normally, when a dog shows its teeth, it is assumed there is going to be a snarl. Not with a Greyhound. A variation of this is also known as “nitting.” No, your Greyhound is not trying to nip at you and rip your flesh; it is telling you how happy it is to be with you. Sometimes, it means “How about a cookie?” or “Let’s go!” And, if she clicks or snaps at your hair or throat, it means “I love you.” The click/snap is actually a replacement for the lick; you will find that most of these dogs aren’t lickers. Sometimes they yelp, bark, or make throaty noises while clicking. “Snorfling” might be a good description of this activity. This is a delicious little movement when the lower lip/jaw vibrates at the speed of sound. This is anticipation and happiness. The elbows and torso are on the floor, the rump is up in the air, there may be a smile on the face: the play posture means fun! Sometimes the play posture is stiff with the feet stomping, although this is more unusual. A modified play bow can occur when a dog wants to play with an inanimate object, as Jan Zulkelski’s Ladybug is demonstrating. This is self-explanatory. They just love to stalk, hunters that they are. Be careful; this is the beginning of aggression or dominance. This was covered in the section on tail-wagging. Another show of dominance (and this can be with people or other animals) is the paw on the shoulder or other body area. It can also mean “You are mine.” Just be aware that there may be some jockeying for alpha position going one here, above and beyond affection. Some of these actions will take place between dogs and children who are smaller than they. This is entering the subject of pack order/hierarchy (if you subscribe to this position) and will be covered in other articles, but consider this: the dog considers a small child as a lesser member of the pack and may try to push the child around. I emphasize may. Most Greyhounds are fine with children, even babies. Most Greyhounds adore quiet, confident children but some, especially females, will discipline unruly children as they would unruly puppies. If the child is shy and not confident (submissive from the dog’s point of view), the dog may try to take a higher place in the household hierarchy than the child. Make sure that the dog knows the child is higher in the pack than he is. Which leads us to the subject of submission. If you see that a dog’s pupils are dilated, if the corners of the mouth are down and the tail is now still and straight out, watch out; you have a dog about to attack on your hands. (The hound may also be drooling at this point.) If this happens to you, do not stare at the dog. Back away slowly and sideways. At this point, the tail will be held out stiffly; the tail is not wagging anymore. If this happens and is directed at a cat or other small animal, separate them quickly and be sure the dog is on a leash. Tail activity means both friendliness and possible aggressiveness. If your dog won’t look at you, lies on his back and shows his belly, urinates or defecates when he or she sees you, a visitor or an animal, he or she is being submissive. Sometimes Greyhounds will not seem to like one member of the household and will walk away from or not go to him. (This usually happens with men in the household, to their dismay.) When this happens it may mean a bad encounter with a man or that they simply never met a man. Take heart; time usually cures this when the dog becomes more trusting. Some Greyhounds are simply afraid of men (or women) in certain kinds of hats and it has nothing to do with a bad experience! If your dog shows signs of dominance but lies on his back and shows you his belly, Congratulations! You have become “The Leader of the hierarchy.” May your household be a happy and harmonious one!